Boiler output range is 24-28 kW. It's used for heating up to 100 m2 house. Fuel that can be used is wood, black coal, briquette etc. 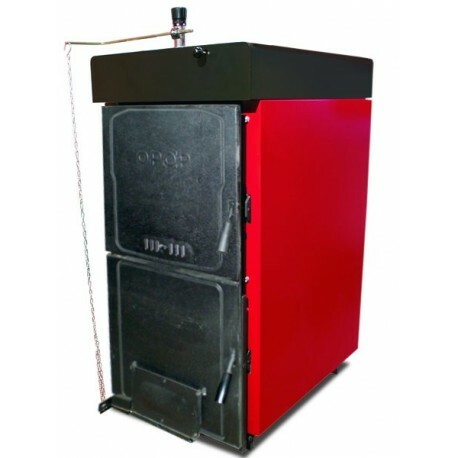 UNI 5 boiler is a cast-iron sectional boiler for burning solid fuels. It is intended for hot-water heating of single family houses and other objects. The boiler enables to achieve a high efficiency and low emission values. The boiler can be used both in gravity heating systems and systems with forced circulation as well as in pressurized water systems. In the event of application in a closed heating system, a safety pressure device must be used to prevent overheating. The boiler burns wood, black coal, briquette etc. Because the heating powers of single solid fuels differ from each other, the boiler output varies between the stated maximum and minimum values.